Tuesday's release of the December New Home Sales from the Census Bureau came in at 621K, up 3.7% month-over-month from a revised 599K in November. 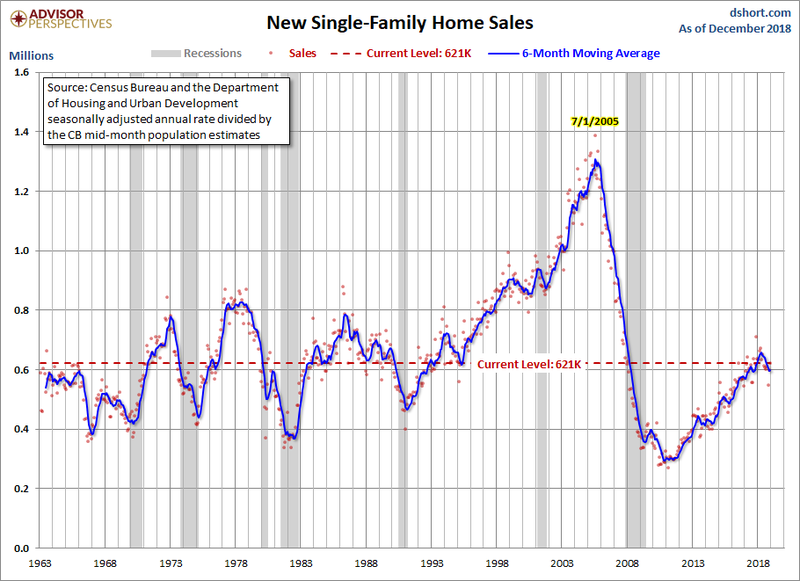 New single-family home sales are 5.1% above the 1963 start of this data series. The population-adjusted version is 39.8% below the first 1963 sales and at a level similar to the lows we saw during the double-dip recession in the early 1980s, a time when 30-year mortgage rates peaked at 18.63%. Today's 30-year rate is about 4.4%. Data collection and processing were delayed for this indicator release due to the lapse in federal funding from December 22, 2018 through January 25, 2019. Processing and data quality were monitored throughout and response rates were consistent with normal levels. Sales of new single‐family houses in December 2018 were at a seasonally adjusted annual rate of 621,000, according to estimates released jointly today by the U.S. Census Bureau and the Department of Housing and Urban Development. This is 3.7 percent (±16.4 percent)* above the revised November rate of 599,000, but is 2.4 percent (±21.3 percent)* below the December 2017 estimate of 636,000. An estimated 622,000 new homes were sold in 2018. This is 1.5 percent (±6.5 percent)* above the 2017 figure of 613,000. For a longer-term perspective, here is a snapshot of the data series, which is produced in conjunction with the Department of Housing and Urban Development. The data since January 1963 is available in the St. Louis Fed's FRED repository here. We've included a six-month moving average to highlight the trend in this highly volatile series. Over this time frame, we see the steady rise in new home sales following the 1990 recession and the acceleration in sales during the real estate bubble that peaked in 2005. Now let's examine the data with a simple population adjustment. The Census Bureau's mid-month population estimates show a 75.0% increase in the US population since 1963. 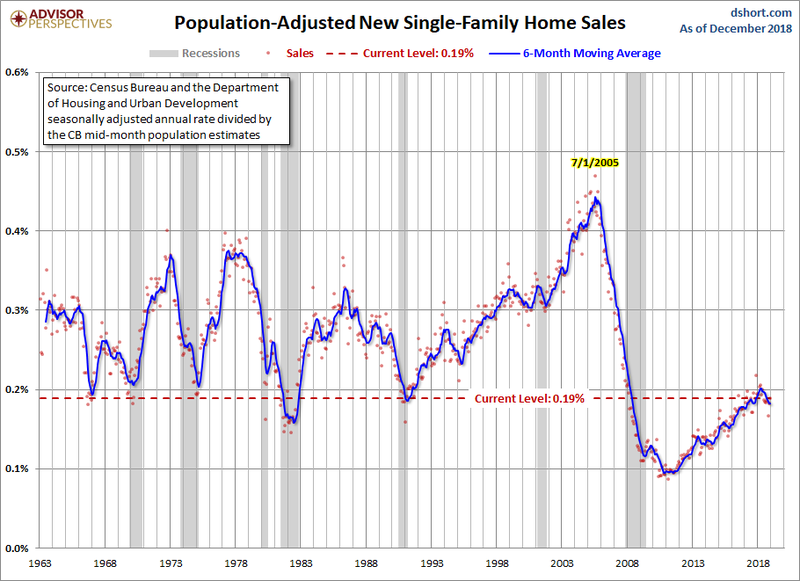 Here is a chart of new home sales as a percent of the population. New single-family home sales are 5.1% above the 1963 start of this data series. 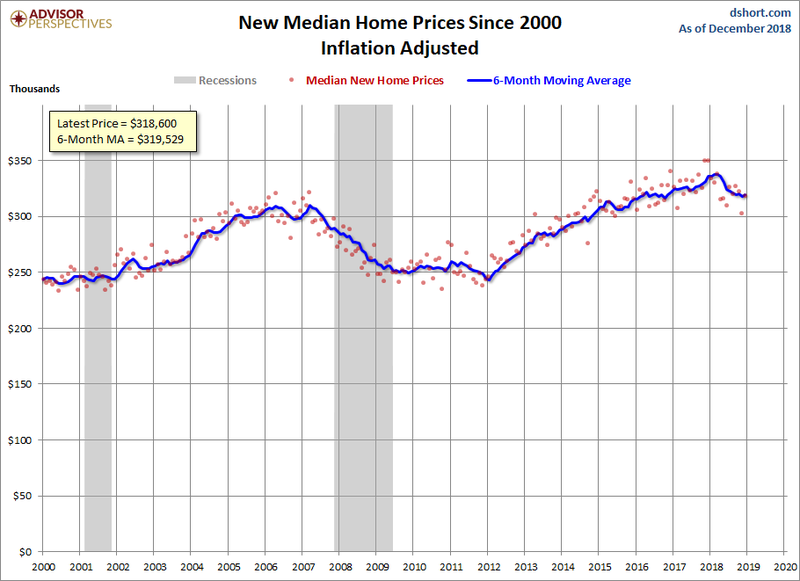 The population-adjusted version is 39.8% below the first 1963 sales and at a level similar to the lows we saw during the double-dip recession in the early 1980s, a time when 30-year mortgage rates peaked at 18.63%. Today's 30-year rate is about 4.4%. 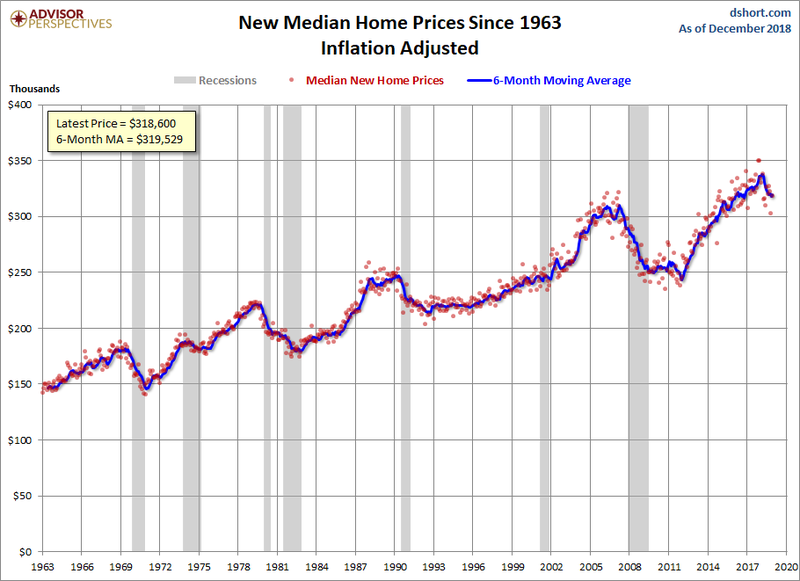 For another perspective, here is a chart of the median new home sale prices back to 1963, inflation adjusted. The data source is also the Census Bureau and can be found on the press release and website above. For inflation adjustment, we use the CPI-U, which is the Consumer Price Index for All Urban Consumers. We've included a six-month moving average for this extremely volatile metric to give us a clearer sense of the trend. Editor's Note: The summary bullets for this article were chosen by Seeking Alpha editors.